Made from Jatropha crop, the fuel has been developed by the CSIR-Indian Institute of Petroleum, Dehradun. 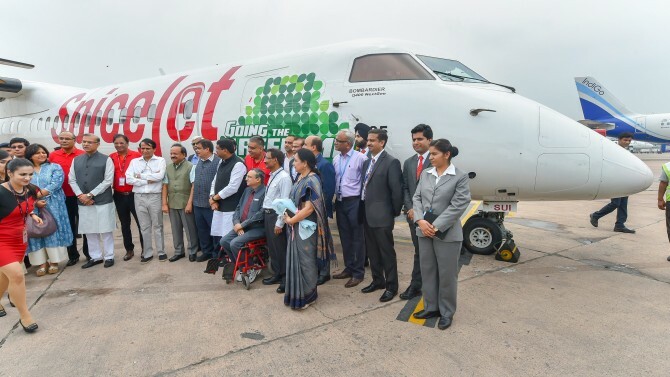 IMAGE: Civil Aviation Minister Suresh Prabhu, Road Transport and Highways Minister Nitin Gadkari, Science and Technology Minister Harsh Vardhan, MoS for Civil Aviation Jayant Sinha, Oil Minister Dharmendra Pradhan and others pose for photographs as Spicejet’s first flight to run on biofuel landed at Delhi Airport on August 27, 2018. Photograph: Kamal Kishore / PTI Photo. SpiceJet on Monday operated India's first test flight powered by biojet fuel, according to the airline. A Bombardier Q400 aircraft, partially using biojet fuel, took off from Dehradun and landed at the airport in the national capital. The airline said it successfully operated "India's first ever biojet fuel flight". Made from Jatropha crop, the fuel has been developed by the CSIR-Indian Institute of Petroleum, Dehradun, SpiceJet said. Around 20 people, including officials from aviation regulator DGCA and SpiceJet, were on the test flight. The duration of the flight was around 25 minutes, according to an airline executive. The biojet fuel has been recognised by American Standard Testing Method and meets the specification standards of Pratt & Whitney and Bombardier for commercial application in aircraft. The Q400 aircraft has 78 seats. According to global airlines' body IATA, aviation industry contributes to two per cent of the total global greenhouse gas emissions. IATA has also set out a target for one billion passengers to fly on aircraft using a mix of clean energy and fossil fuels by 2025, the release said. SpiceJet has a fleet of 36 Boeing 737NG and 22 Bombardier Q400 planes. On an average, it operates 412 flights daily.